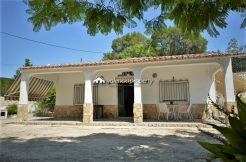 Rustic property of 12920 sqm and country house completely renovated and equipped to live all year, in Enguera. It is a town of five thousand inhabitants southwest of the Province of Valencia, which offers all kinds of services and facilities necessary for daily life: shops, restaurants, medical service, veterinary, supermarkets, schools, sports center. It is one hour and a half from Alicante Airport and one hour and ten minutes from Valencia Airport. The plot has an area of 12920 sqm, the access is partially asphalted, it is simple, once it is known, and in which it is invested only 10 minutes from the center of the nearest town. As soon as we get close to the house, we immediately realize that it is a very private area with few neighbors, and those that live throughout the year, are far apart. There are 165 olive trees in production and it has water from the irrigation cooperative of Enguera. Electricity is obtained from a powerful solar energy system. The house (175 sqm built) has two access doors, one is the main one through which you can access the living room directly. And the other is the service door of the kitchen, which is on one side. It was completely renovated, and its distribution consists of: ground floor (66 sqm) in which there is a large and cozy living room with fireplace and a large kitchen, both rooms communicated through a hole in the shape of a horseshoe arch. Outside, immediately after the wall of the dining room, the barbecue is located, it also serves as a covered warehouse for firewood. The first floor (38 sqm) has three double bedrooms, all are exterior, and except for the one in the center, the other two, being in the corners have two windows each. The master bedroom has a small integrated bathroom (en suite). At the end of the corridor, the larger family bathroom is located, which has a shower with a flat entrance and the finish of the walls is covered with Gresite tiles. Outside there is an irrigation pond, a storage room and a house for the pet. Several fruit trees give shade to each different facade of the house. It is a very well finished house, built on solid ground and rock. It is ideal for lovers of privacy. Surrounded by a sea of olive trees, you will not have to be worried about that aspect since you will be far from the noises of the cities and you will find yourself with the most absolute silence, only interrupted by those that you can produce yourself or by those that are emitted in two specific seasons of the year: the pruning and collection of olives. 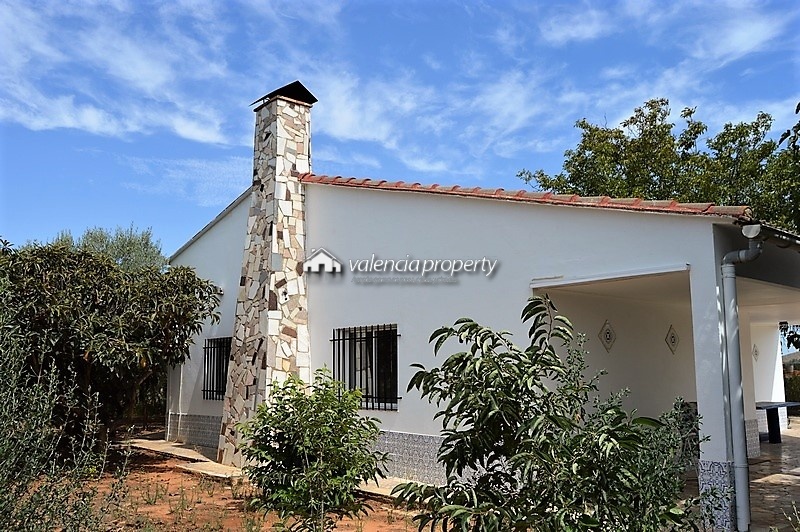 Renovated villa, 3 bedrooms, very close to Xàtiva. 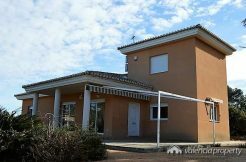 Detached Villa with stunning views, in Xàtiva. Only 5 km from the city center.